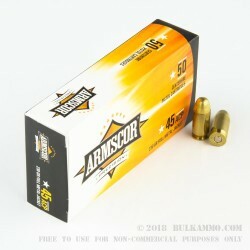 Armscor brings you one step closer to victory in the .45 ACP price war with its affordable yet strong-performing ammunition. 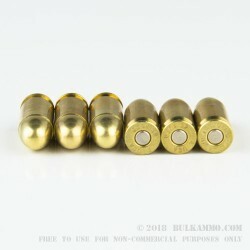 These cartridges, made to SAAMI specs, use a standard 230 grain bullet and achieve a muzzle velocity of 830 feet per second. 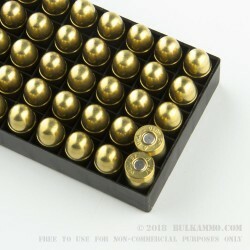 Each cartridge in this box of 50 is cased in boxer-primed reloadable brass cases. Perfect for target practice in a 1911 or Glock 21. 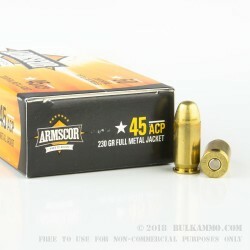 Based in the Philippine capital of Manila, the Arms Corporation of the Philippines (Armscor) has produced firearms and ammunition since 1952. It is a highly experienced manufacturer of 1911-pattern pistols sold under brand such as Charles Daly, Auto Ordnance, and Rock Island Armory. The company uses CNC machining and follows ISO 9001 standards. A frequent supplier to the military of the Philippines, it staffs the 1st (Armscor) Arsenal Battalion (Reserve), a support unit in the Armed Forces of the Philippines Reserve Command.